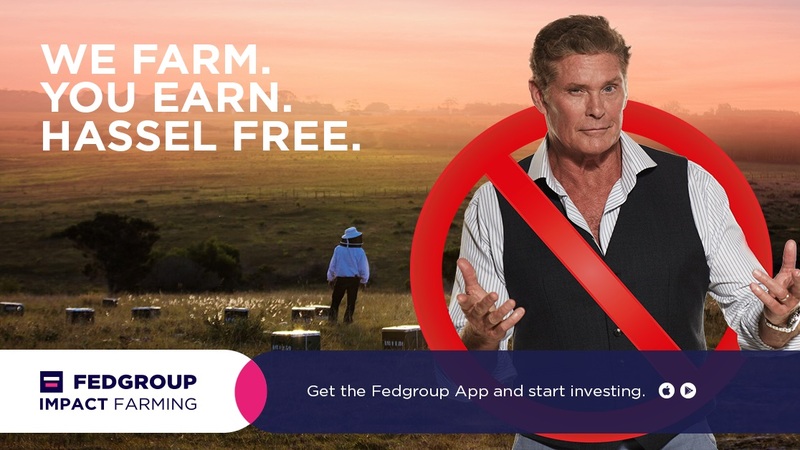 Fedgroup has appointed David Hasselhoff as the spokesperson for its latest ad campaign. The campaign aims to emphasise how Fedgroup is making investing 'Hassel-free' for South Africans with its Impact Farming app. "This idea came about through a serendipitous round-table discussion," says Jonathan Bain from Bain & Bunkell. "It has been an incredibly collaborative process, with representatives from PR, strategy, media and agencies, as well as taking part in client meetings regularly to discuss the various aspects of launching the innovative Fedgroup Impact Farming platform," Bain adds. "We called Hasselhoff's agent on the off-chance he’d be interested. He was. Brave clients at Fedgroup, Tim Allemann, Grant and Brett Field, took the leap. And so, 'Hoff magic' happened," he says. "The key benefit of Impact Farming is its ease of use. We’re taking out the complexity of investing and lowering the barriers to entry – you don’t need massive capital or expertise to get started," adds Tim Allemann, CMO of Fedgroup. The ad campaign launched on various channels, such as M-Net, SuperSport, National Geographic, and on radio stations Hot 91.9, 702 and RSG. Viewers can also see the ad on websites like Business Insider, Moneyweb and Fin24. For more information, visit www.fedgroup.co.za. You can also follow Fedgroup on Facebook or on Twitter.